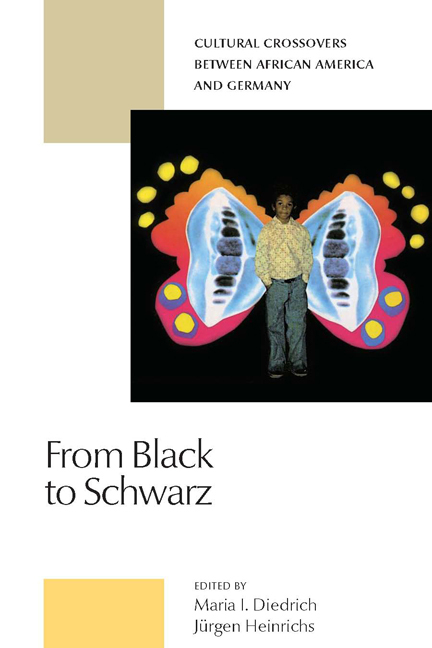 From Black to Schwarz explores the long and varied history of the exchanges between African America and Germany, with a particular focus on cultural interplay. Covering a wide range of media of expression—music, performance, film, scholarship, literature, visual arts, reviews—these essays trace and analyze a cultural interaction, collaboration, and mutual transformation that began in the eighteenth century, boomed during the Harlem Renaissance/Weimar Republic, survived the Third Reich’s “Degenerate Art” campaigns, and (with new media available to further exchanges), is still increasingly empowering and inspiring participants on both sides of the Atlantic. Maria I. Diedrich holds a Chair in American Studies at the Westf\u00e4lische Wilhelms-Universit\u00e4t M\u00fcnster in Germany. Her research focuses on African American studies, and she was the founding President of the Collegium for African American Research (CAAR) from 1992-2001. J\u00fcrgen Heinrichs teaches art history and museum studies at Seton Hall University. His research explores the interrelationships between African American and European art and visual culture.